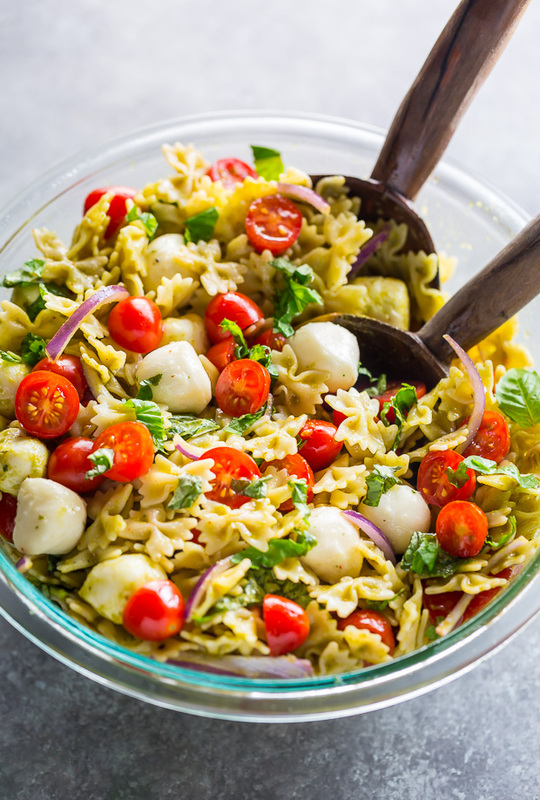 This 20-Minute Tomato, Basil, and Mozzarella Pasta Salad is fresh, fast, and flavorful! 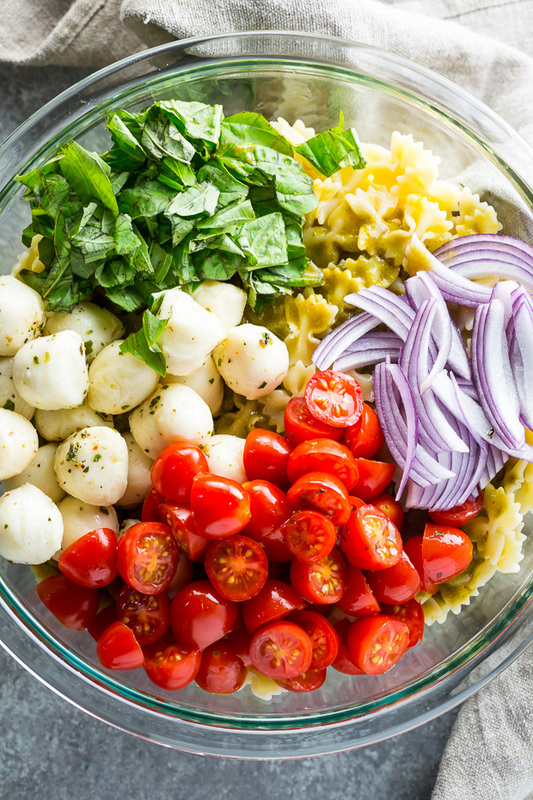 The perfect quick and easy Summer Pasta Salad recipe. Make it for your next party, picnic, or BBQ! This recipe can be made in advance! In fact, I think it tastes best after 24 hours in the fridge. It allows the flavors to mingle and develop. Plus, who doesn’t love a big bowl of pasta waiting for them in their fridge?! If you’re going to make this pasta salad in advance, be sure to cook your pasta al dente. Overcooked noodles will quickly get mushy in this salad, and that would be a shame! I find 7 to 8 minutes at a full boil is usually perfect – but this will vary depending on the variety and brand of pasta you choose. 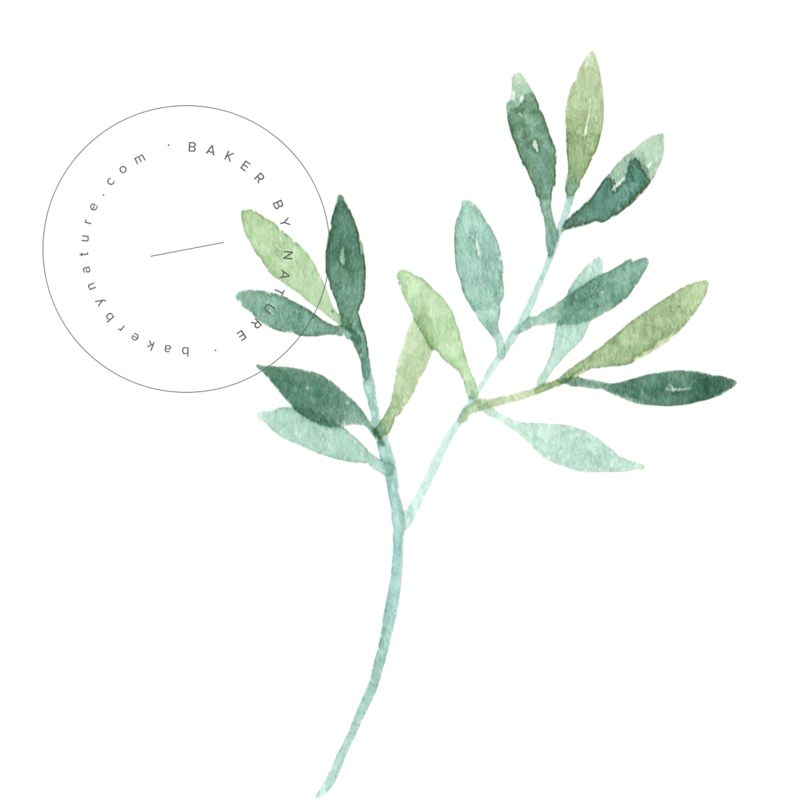 Speaking of pasta – let’s talk varieties. I have a strong preference towards farfalle, but that doesn’t mean you have to use it! Feel free to sub in penne, elbow noodles, or fusilli. Rigatoni could work in a pinch, but I find noodles with crevices shine best in pasta salad. They catch all that yummy dressing!!! While we’re on the subject of the dressing, you can make that ahead of time, too! Just be sure to cover it well and store it in the fridge. 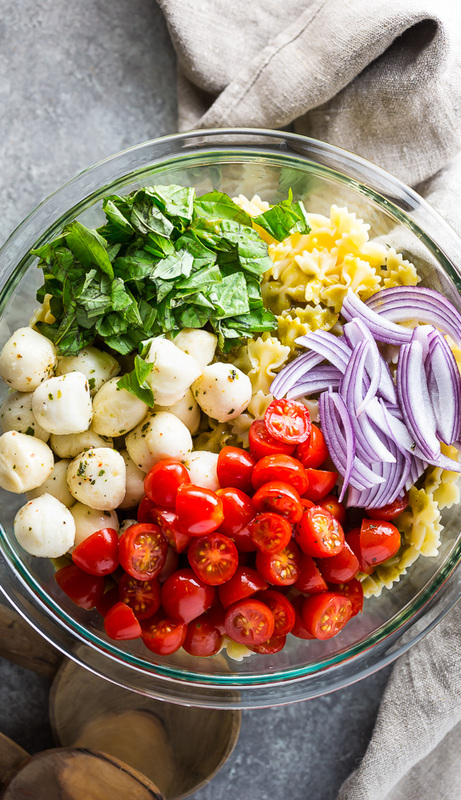 I kept this 20-Minute Tomato, Basil, and Mozzarella Pasta Salad very simple – and vegetarian friendly – but feel free to bulk it up by adding some shredded chicken or chopped shrimp. Or add more veggies like broccoli, arugula, or avocado. It’s very adaptable! 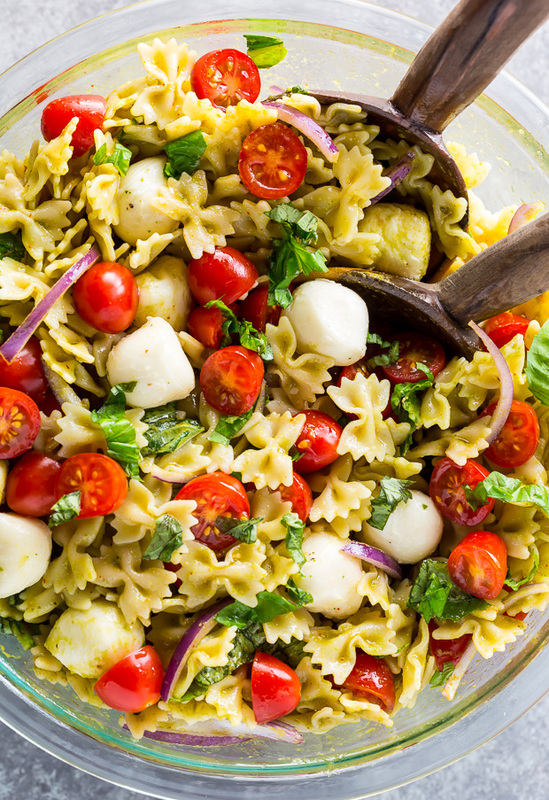 This is basically SUMMER in pasta salad form… I hope you make it and enjoy it! 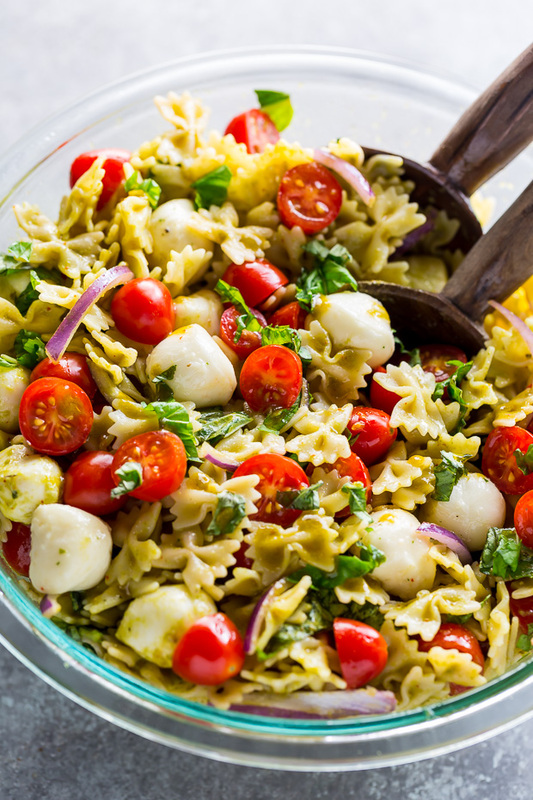 This 20-Minute Tomato, Basil, and Mozzarella Pasta Salad is fresh, fast, and flavorful! In the bowl of a food processor or blender, combine the basil, garlic, olive oil, lemon juice, sugar (if using), salt, and pepper. Pulse on high for about 2 minutes, scraping down the sides as needed, or until smooth. There should be no large chunks of anything! If there is, continue blending. Set aside until needed. Place a large pot of salted water over high heat; bring to a rolling boil. Add pasta and cook until al dente, about 7 to 8 minutes. While the water comes to a boil and the pasta cooks, prepare the vegetables. Slice the cherry tomatoes in half; thinly slice the basil and thinly slice the red onion; set aside until needed. Remove the mozzarella balls from the oil and set aside. When the pasta has finished cooking, drain it at once and quickly rinse it under cold water until cool, about 1 minute. Place cooled pasta in a large mixing bowl. Add dressing to pasta, then add the tomatoes, basil, onion, and mozzarella balls. Toss to combine. Serve at once, or chill until needed. Pasta salad may be made and stored in the fridge for up to 3 days. I definitely laughed out loud at those blog names! This looks so fresh & perfect for summer, love it! I love laughing out loud; glad I did that for you!! Haha, I love the fictional blog names 🙂 The first one describes me perfectly! Your photos are SO beautiful. I hate tomatoes, but your photos of them have me drooling! Tomatoes are pretty photogenic; lucky them! This looks soooo good. Everything I dream about in a pasta salad. 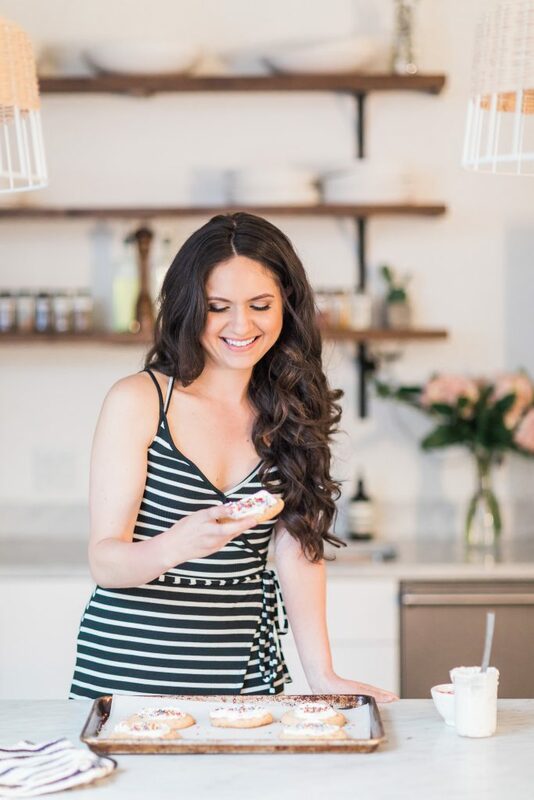 Thanks so much for checking out my sweet and salty cake, so glad I found your blog that way! Can’t wait to check out the rest! sweet and salty is a match made in heaven. Ha! I love those alternate blog names! And, this dish looks really great, especially now that the warm weather is here. I can’t bear hot food when my skin is melthing; ya know what I mean? Caprese salad always reminds me that summer is officially here! Last thought: I wish fresh mozzarella weren’t so expensive to get! This looks so lovely for a hot Texas al fresco dinner! I don’t eat olives, but suppose I could up the rest of the ingredients a bit to compensate. I get cranky without carbs as well…I could eat pasta every night, but I limit myself to once or twice a week. You could try adding capers… or just omit and enjoy! Great looking pasta salad, I’d say post food that makes you happy – who says bakers can’t cook. Looking forward to seeing more of your delicious creations. So simple, yet so delicious. Love the flavors in this dish! Great blog names!! And even better cold pasta dish! Love the seasonal fresh ingredients, so pretty and healthy! A big bowl of this for dinner and leftovers for lunch – perfect! The leftovers are even tastier; no lie. Does this ever sound good! I’m never afraid to add extra garlic, as I love the flavor, but I always have to have gum, mints, mouthwash, or ALL on hand. Speaking of garlic, there’s a restaurant near me called the Stinking Rose (It’s been on the Travel Channel, etc.) and I’m dying to try it. Apparently they use so much garlic that cabs won’t pick people up from the restaurant because they smell so bad after the meal. Now that’s serious! I have seen that on the travel channel! You have to go and let me know how it is, and I would recommend driving given the can situation… walking home smelling like a garlic field is never good. Thanks for visiting my food blog. I am a pasta person myself. Can’t get enough of daily carb doses 😉 These recipes looks so delicious with summer staples from a local farmers market. And I love your food photography. Go girl! I am so delighted to finally see GREEN items at my greenmarket! Yessss I love summer salad recipes! This is killing me it looks so good. I love garlic so much and am so happy that you aren’t afraid to use an abundance! Oh my gosh, this looks so tasty!! I’m also a fiend for pasta of any shape, size, or variety. An absolute fiend. I’m definitely going to make this next week…thanks for sharing! I’m glad you found my ridiculous toilet-cleaning post I shared earlier today 🙂 A friend called and said, “Um, did you just blog about your TOILET?” Ha! Seriously, it’s a great tip. Let me know if you try it, and I’ll definitely be back to visit your awesome site soon! I am so with you here! I am cranky and starving all day long without carbs! I hear some people are gluten-intolerant these days. Me? I’m intolerable without gluten. Oh let me tell you; I tried gluten free living for a few weeks (to figure out why the heck I was sick all the time) and it was horrible! No pasta and no beer can lead to a very cranky gal. Thanks so much for visiting my blog today! Always fun to meet new folks. The cherry tomatoes in this post are beautiful! This post cracks me up and makes me hungry all at the same time. Really great! I love the pictures of the tomatoes in the little baskets. Are the the baskets made out of ceramic? I must find some of those. They are ceramic; found them a few weeks ago at anthropologie. This salad looks beautiful. Perfect for a warm day! This is such a lovely colourful summer pasta! I really want those mozzarella balls and pine nuts but I know this salad will be just fine without them. (allergies) I’m really hungry and this sounds great. You could always throw in other topping your not allergic to; I seem to be allergic to Spring this year! I’m so glad you visited my blog and left a comment – because it led me back to your blog, with which I am now OBSESSED. I’m tearing up at the hilarious website names you listed, and this pasta salad looks delicious! Glad to make new foodie friends. Foodie friends are totally the best part of food blogging. Wait… or maybe the food is? Two posts in and I’m already subscribing to your blog. You are cracking me up tonight. I adore that pasta salad. I make one very similar, but I’m going to try yours soon! And chocolate pudding? Are you kidding me? I spent 20 minutes earlier today looking for an awesome make from scratch pudding! Couldn’t find one that appealed to me at all. What are the odds that you were reading my future thoughts when you posted that one? ha. That recipe is now in my soon to be tried file. Thanks! You are too sweet for words! Seriously… I ate 90% of that pudding. Ironically enough I have a boyfriend who diets… like what?!? Make it, please!!!! I can’t tell you how excited I was when I first found out garlic was good for you (not like I needed any excuses to use it in everything!). Love this dish. It’s such an added bonus that it’s actually gooooood for you! This salad looks amazing! I made a similar one two days ago, but less garlic-y. I’ll have to give this one a try! The garlic gives it an extra kick; if you like that kind of thing. What’s Going down i am new to this, I stumbled upon this I have found It absolutely useful and it has aided me out loads. I’m hoping to give a contribution & aid other customers like its aided me. Great job. Thank you for your working for us. I want to make this salad. This recipe is fit for my family. I’ll try it tomorrow. I could eat this for my entire meal- Yum! This looks amazing! I am making it tonight. Just to make sure — this calls for 8 ounces total of basil? I too thought that 8 oz of basil seemed a bit much. I didn’t use nearly the amount. I think the pasta salad still turned out great, but plan to add a bit more basil next time. I was afraid it would be too overpowering. I have a feeling this will be my go to pasta salad recipe for a while. I think I may add some pine nuts next time as well. They are super yummy in pasta salads. Great idea to add the pine nuts! I made this yesterday for the 4th if Juky! Big hit!! Made this last month and loved it! Although I do have a question about the amount of basil, you say 8oz do you mean by volume or weight. It seemed way too much when I bought the basil by weight. Will be making it again this weekend. My dressing came out completely green (almost like a green smoothie) because of the amount of basil used. Definitely didn’t look like the picture but was delicious regardless. Also curious about the onion being put into the dressing in the video but not in the recipe. Just finished making it. Surprised how easy it was but how fancy it tasted. No one has mentioned the fact that the video for the dressing shows red onion being added, yet it is not one of the ingredients listed for the dressing. Is it to be included, and if so, how much? I want to make this for a cookout on Sunday, September 3, 2017. Thank you! If I am making this a day ahead of time, do I put the dressing on before it goes into the fridge or when I am going to serve it? Thank you!! It looks great. I am going to bring it to a holiday party since it’s so festive. When you say large 8 bowls,does that mean for 8 people or could 1 bowl feed 2 people? I made this yesterday. It took me quite a bit longer than 20 minutes. Lol. I doubled the recipe. Big hit for the 4th of July! It was fabulous!!! I made this and it turned out very green and looked nothing like the picture. How was yours not green with 4 oz of basil which is more tha 2 cups packed? I just made this, and it came out so green, as others have noted. Boyfriend accused me of doing something wrong, because it looks nothing like the photo. It didn’t seem properly balanced at all. What did I do wrong? Hi Kat. I’m sorry you didn’t enjoy this recipe. The dressing in my photos is actually green (if you look at the first photo the noodle in the front and the mozzarella ball show that color). But you could reduce the amount of basil for a less green dressing. Thank you i added boiled eggs fresh grated zucchini very tasty salad would not add my stuff again.